Whilst a paddling “dry jacket” will never be 100% watertight, and eventually water will find its way in through the seals, they are generally considered good enough to be referred to in this way. They are the most effective way to keep the top half of your body dry if you’re unlucky enough to find yourself upside down in your boat, a common occurrence in all disciplines of white water kayaking. With strong latex seals at both the neck and wrists, combined with a ‘twin-waist seal that combines with a spraydeck. Some of these cags will have Glideskin neck seals as opposed to Latex and are referred to as ‘semi-dry cags’. These high end jackets prevent *water flushing through them, keeping base layers worn under the top for warmth dry, more comfortable and able to offer insulation from the cold. Worn with dry trousers or over a long-john wetsuit, these dry cags offer a versatile way of enjoying time on white-water rivers throughout the UK and abroad. All of these drytops share common features, but what splits these jackets apart are the materials they are constructed from. In general, the better grade fabrics offer higher levels of waterproofing and breathability. Offering a great mid range white-water cag with all the features present found on this style of dry-top but with an affordable 2.5 layer breathable fabric. A premium top-of the range range white-water top for paddlers wanting the most performance from their equipment. Highly breathable, durable yet flexible and extremely comfortable to wear. A mid-weight semi-dry cag with a comfortable Glideskin neck seal, which also makes it easy to remove with wet hair. Teamed up with an affordable 2.5 layer breathable fabric. Palm's most advanced, flagship white-water drytop, packed with features, cut to give unparalleled freedom of movement and constructed from tough, durable materials. A semi-dry cag, constructed from premium fabrics at an affordable price. 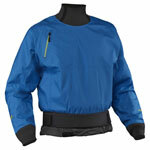 Suitable for all on-water paddling activities, where both comfort and staying dry combined are a priority.